Kow Kountry and Pasture Grazer Minerals are formulated for the cattleman that is serious about the rebreeding success of his herd. Both are designed for the 1000# - 1200# cow and will easily meet the nutrient requirements of this cow as well as cows larger than 1200#. These minerals are formulated with the highest quality ingredients that are more available to the biological make-up of the animal. Particular care has been paid to achieving correct calcium to phosphorus ratio to compliment to pastures in this area. Kow Kountry Mineral has a guaranteed calcium level of not more than 12%, a guaranteed phosphorus level of not less than 10%, and a guaranteed salt level of 16%. The calcium level in Pasture Grazer Mineral is guaranteed to be no more than 15% and the phosphorus level is guaranteed to be no less than 7%. The salt level in this mineral is 22%. These levels are usually adequate to keep consumption at 3 oz. to 4 oz. per head per day. At certain times during the year, it may be necessary to mix additional salt to keep consumption at the recommended level. Usually this can be accomplished by adding 10# - 25# of salt to each 50# of mineral at the mineral feeder. After one or two times of mixing, the additional salt can usually be eliminated. The trace mineral package used in Kow Kountry Mineral and Pasture Grazer Mineral is unique to the industry in that it contains a combination of sequestered and chelated trace minerals as well as three natural "ruminant bug builders." The bioavailability of the trace minerals is most important to the cattle producer. Dr. Jerry Spears, a nationally known beef cattle nutritionist from North Carolina University, is a leader in performing nutritional studies on the effect of different trace minerals in the ruminant diet and what effect this has on their reproductive system. In a study done by Dr. Spears on trace minerals he concluded "that the use of certain organic trace mineral complexes or chelates in ruminant diets has increased performance (growth and milk production), carcass quality and immune responses and decreased somatic cell counts in milk compared with animals fed inorganic forms of the mineral. Trace minerals sequestered as amino acid or polysaccharide complexes have the highest biological availability and also have a higher stability and solubility. These mineral forms also have a lack of interaction with vitamins and other ions and are effective at low levels." To our knowledge, our mineral products are the only ones on the market today that use the sequestered polysaccharide complexes. In both Kow Kountry Mineral and Pasture Grazer mineral, zinc is guaranteed at 4000 ppm, copper at 2000 ppm, selenium at .00264%, and iodine at .007%. In studies, the sequestered trace minerals have proven to reduce days to conception by 53% for first calf heifers and by 35% for cows. The use of natural "ruminant bug builders" is also an important aspect of our minerals. Getting the most digestibility out of the feed nutrients is essential to the success of a ranching operation. Our minerals use a yeast culture, a dried aspergillus meal fermentation soluble and six other dried fermentation solubles that allows the animal to get maximum digestion and availability out of native pastures or quality feed ingredients. Ru-Min-Ade, which is another "natural ruminant bug builder," is also available to be added on a custom basis that will further enhance digestion of available feedstuffs. Vitamins A, D, and E are also essential to the reproductive program. With vitamin A at 120,000 IU per lb., vitamin D at 15,000 IU per lb., and vitamin E at 100 IU per lb., adequate levels of each will be obtained by the animal. 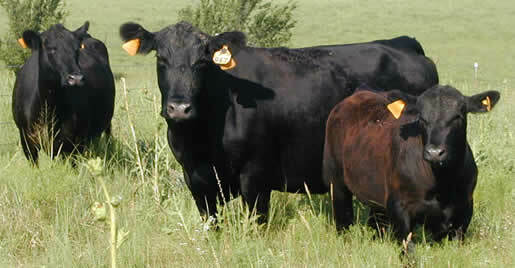 The use of chlortetracycline can also play an important part in the overall rebreeding success of the herd. By using it at the "correct" times in the year, you will increase your conception rates, increase weaning weights and decrease weaning stress and the chance of anaplasmosis in your operation. Chlortetracycline will also aid in the preventing foot rot as well as bad eyes in the cow herd. Kow Kountry and Pasture Grazer Minerals have proven to work in quality operations like your ranch. During the past few years, we have worked with several ranches that are doing embryo transfer work and artificial insemination. These ranches indicate to us that since switching to our mineral program, they have seen an increase in first service conceptions and thus more calves being born in the first 21 days of the calving season. This increases the overall weaning weight of their calves and adds revenue to the operation. They have also reported less open cows that we feel are primarily due to the trace mineral package that is in our minerals. Reduction in bad eyes, foot rot, anaplasmosis, and other herd health problems are also reported. Min Mix Minerals would enjoy the opportunity to be of service to your ranch. Although our minerals MAY be a little more expensive than some and much LESS expensive that others, the "dollar value for dollar spent" is beyond comparison. Every ranch strives for bigger calves at weaning and less open cows at "preg checking" time. We believe our mineral products will enable your ranch to achieve this goal.